U.S. Secretary of State Hillary Rodham Clinton recently visited Cambodia as part of an Asia tour and gave remarks in support of the accountability process underway there. A country that is able to confront its past is a country that can overcome it. ... Countries that are held prisoner to their past can never break those chains and build the kind of future that their children deserve. ... Although I am well aware the work of the tribunal is painful, it is necessary to ensure a lasting peace. See here for her remarks after her visit to Toul Sleng. As we've blogged before, the future of the ECCC remains uncertain. Case 002 against regime leaders is proceeding apace, but Cases 003 and 004, against mid-level former Khmer Rouge, are controversial. The Cambodian Prime Minister, Hun Sen, has indicated he does not support these cases, ostensibly because they will plunge the country back into civil war. His remarks and the intransigence of the Cambodian Co-Prosecutor and Co-Investigating Judge in moving forward on the two cases have given rise to concerns about political manipulation of the ECCC. The assumption is that individuals under investigation are political allies of the Prime Minister, who recently told U.N. Secretary General Ban Ki Moon that he should close down the U.N.'s human rights field office because it is interfering in Cambodian internal affairs. 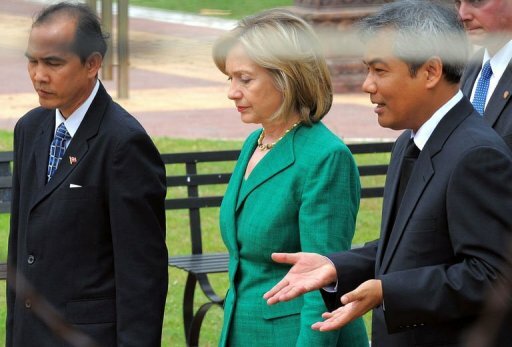 The above photo at left is of Secretary Clinton with Youk Chhang, founder/director of the Documentation Center of Cambodia. 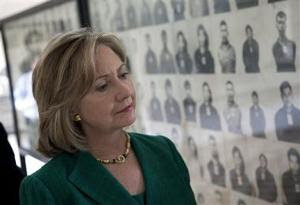 The photo at right is of the family (grandchild, daughter, and son-in-law) of Chan Kin Srun, one of the detainees killed at Toul Sleng in 1978 being given a photograph of Secretary Clinton looking at Chan Kin Srun's intake portrait at Toul Sleng. The Khmer Rouge meticulously documented the identity of each detainee before interrogating and then executing him or her. Kudos to Secretary Clinton for keeping accountability high on her agenda in the region. 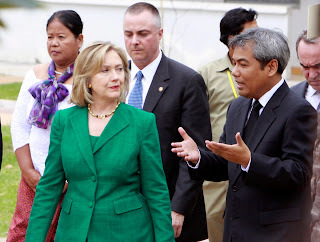 Is the Obama administration's push to deport Cambodian refugees part of Clinton's visit to Cambodia? The U.S. plays the role of stern mentor well, overlooking its own role in decimating SE Asia in the 1970s and in now violating the right to family life by deporting longtime residents back to Cambodia decades after the U.S. offered them refuge from the genocide. And after they've established families in the U.S.